There are many rumors and myths surrounding root canal therapy. Most are scared of those 3 little words, but there is no need to be scared. Below are some of the myths and rumors that are believed about root canals. FALSE: Root canal therapy actually relieves the pain you are feeling. By removing the damaged tissue (nerve) from the tooth, we are, in fact, removing the pain. Pain is caused by the nerve going bad in the tooth or severe damage to the tooth’s structure. By removing the source of nerve endings that send pain signal to the brain, you can no longer feel pain in that tooth. Most people state that having a root canal is no more painful than having a filling placed. FALSE: By removing the tooth, you are compromising your smile as well as your ability to digest food. It’s important to try and keep all of your natural teeth for as long as possible. It is true that sometimes root canals do not completely remove the infection or re-infect and HAVE to be removed, but a good dentist will try everything possible to save that tooth before just extracting it. When you are missing teeth, it’s more difficult to chew or can cause an impact to self esteem when the missing tooth is visible to others. The next best option would be an implant to replace the missing tooth, but nothing can completely replace our natural teeth. In addition, implant therapy can be quite expensive. Missing teeth can also impact the teeth surrounding the area including the tooth above or below it that it chews with or the teeth on either side. Those teeth will move over time and cause further issues in your mouth. When a tooth goes bad, one of the best options to save that tooth is a root canal. FALSE: People likely believe false things that they read on the internet. Don’t believe EVERYTHING you read. Most of this rumor was based on long-debunked and poorly designed research performed nearly a century ago by Dr. Weston A. Price, at a time before medicine understood the causes of many diseases. The truth: There is no valid, scientific evidence linking root canal-treated teeth and disease elsewhere in the body. A root canal is a safe and effective procedure. 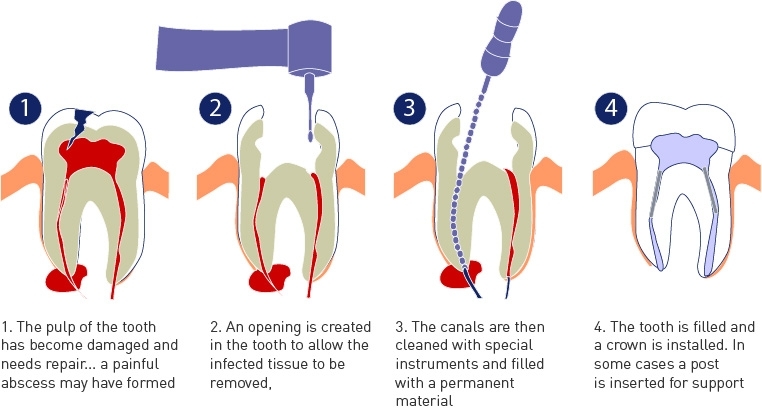 When a severe infection in a tooth requires a root canal, that treatment is designed to eliminate bacteria from the infected root canal, prevent reinfection of the tooth and save the natural tooth. But what about Dr. Price? This is a good example of how the Internet can give new life to long-dispelled theories. Believe it or not, the misinformation about roots canals that is found on the Internet is still based on Dr. Price’s century-old, discredited research. Basically, root canal therapy is simply an extended filling. Instead of just removing the decay and placing a filling in the top part of the tooth, the filling is going all the way to the tip of the root. We remove the nerves and blood supply to the tooth, so you can no longer feel pain and place a filling material to strengthen the tooth. You will likely still need a crown on top of the tooth in order to keep it strong, but this option is much better than some of the alternatives. There is no need to fear having a root canal. If you are in pain and need a good opinion, contact our office today!